A global innovator in open-area dust management has announced that the company’s most established core products have been successfully certified as meeting Underwriters Laboratories (UL) and Canadian Standards Association (CSA) standards. After a lengthy testing phase, three direct-drive designs from Dust Control TechnologyTM (DCT) have been certified for the USandCanada:theDustBoss® DB-30,DB-45and DB-60. They are believed to be the first atomized misting units for dust control to earn the coveted recognition, reinforcing the manufacturer’s position as a world leader in safety for dust control equipment. Using standards developed by UL and CSA, the evaluation and certification process was conducted by SGS, a globally respected Nationally Recognized Testing Laboratory (NRTL) accredited by OSHA (Occupational Safety and Health Administration). The organization is an ISO Guide 65 Certification Body accredited by International Accounting Standards (IAS) to list products in the U.S. The NRTL program was created by OSHA in 1995 to standardize testing across multiple providers and has become the measure of safety testing for equipment manufactured around the world. The certification process required DCT to submit equipment for rigorous testing under a specific set of criteria. In addition to equipment testing and quality assurance process review, the company must meet an ongoing series of benchmarks in order to maintain the certification, including factory inspection and quarterly product inspections. The DustBoss series of oscillating atomizing sprayers is designed for safe and effective open-area dust and odour suppression, with a variety of safety features such as fans with heavy-duty guarding, atomizer rings with pressure output that’s safe enough for bare fingers and industrial strength, steel-framed wheeled carriages or skid mounts. The high-powered fans distribute the atomized mist at noise levels below OSHA approved decibel thresholds and low water usage allows safer control of runoff. Underwriters Laboratories was established in 1894, and is the world’s largest non- profit product safety certification organization, with global name recognition and acceptance. UL has participated in the safety analysis of many of the last century’s new technologies, most notably the public adoption of electricity and the drafting of safety standards for electrical devices and components. The organization provides safety-related certification, validation, inspection, auditing, advice and training services to a wide range of clients, including manufacturers, retailers, policymakers, regulators, service companies and consumers. The Canadian Standards Association is a not-for-profit organization which publishes standards in print and electronic form and provides training and advisory services. CSA is composed of representatives from industry, government and consumer groups, and is accredited by the Standards Council of Canada, a government-owned corporation which promotes efficient and effective standardization in Canada, as a standards development organization and as a certification body. This accreditation verifies that CSA is competent to carry out these functions, and is based on internationally recognized criteria and procedures. The CSA registered mark shows that a product has been independently tested and certified to meet recognized standards for safety or performance. 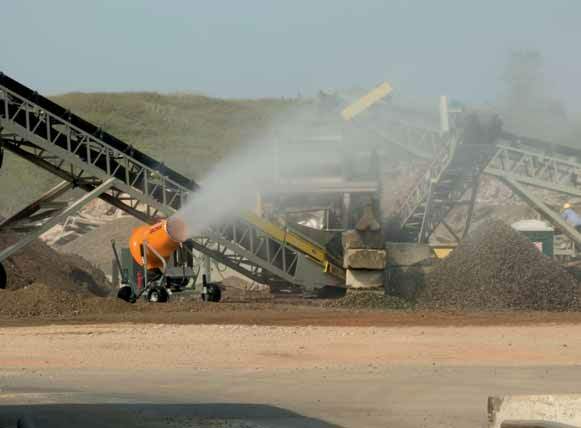 Dust Control Technology is a world leader in dust management solutions, with expertise in a wide variety of industries, including demolition, aggregate processing, scrap/recycling, mining, coal handling, steel/slag, ports and shipping. The company specializes in atomized mist technology, with its focus on equipment for dust suppression and odor control. Its staff helps customers analyse particle sizes and characteristics, working environments and other factors to ensure effective performance under real-world conditions. DustBoss units have been proven far more effective and efficient than manual spraying, with some customers realizing payback in less than six months. DCT has now served customers in 35 countries on six continents to date, and the company’s equipment carries an industry-best warranty of 3 years/3,000 hours. Units can be purchased outright or rented from an extensive equipment fleet.